"This is the easiest recipe I've found for making Pozole. Your kitchen never smelled so good! Excellent on cool or cold day. We garnish it with cilantro and sliced radishes and serve with a side of Mexican rice and tortillas." Remove the stem from the rehydrated chile pepper. Combine with 1 can of chicken broth in a blender or food processor, and puree until smooth. Pour into a 5 or 6 quart slow cooker. Pour in the remaining can of chicken broth, and add the beef broth, pork, chicken, onion, garlic, green chilies, and white and yellow hominy. Season with the bay leaf, oregano, and cumin. Cover, and cook on High for 4 to 5 hours, or on Low for 6 to 7 hours. Remove the bay leaf before serving. Mexican stew with hominy, pork and dried chile peppers made in a slow cooker. 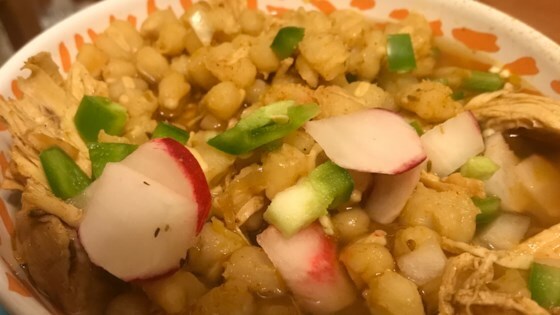 In mexico (i'm mexican) people eat pozole in diferent ways depending where you live, but this recipe is not pozole is more like a soup and is missing all the flavor. This recipe is very good and can feed a lot of people. I used pork shoulder roast and I left out the chicken. I also added one can of Red Chile Colorado sauce. I liked this pozole. Although I do prefer red chiles. Someone said this was like a soup. That would be because it IS a soup.